Being good at numbers has taken on a whole new meaning when it comes to attracting the next generation of Chinese consumers. 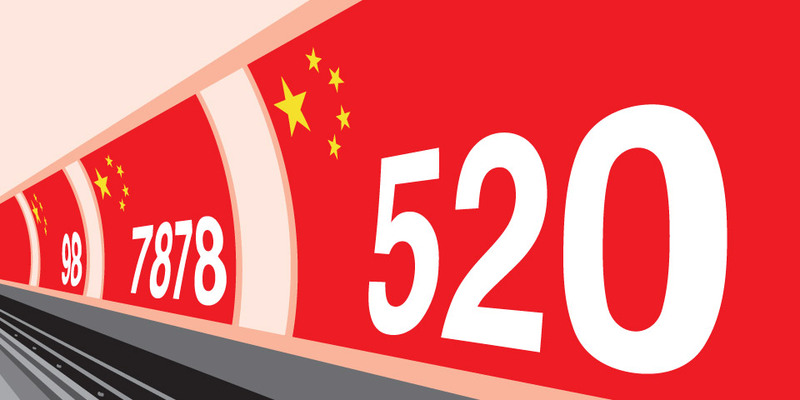 Recent visitors to central Shanghai may have noticed a massive billboard with nothing but 520[…] written in the middle. Don’t worry, the advertisers didn’t forget the key message. This Digitalk is all part of an emerging trend that could hold the key for brands who want to successfully market their products and services to the Chinese ‘post-90s’ generation. Born from 1990 onwards, these highly lucrative consumers have only ever experienced China’s economic success. They will soon become the country’s most active spenders as they prepare to graduate from University in or around 2012. With as many as seven streams of income – their salary, pocket money from both parents plus two sets of grandparents – the post-90s can afford to live a lavish lifestyle that their Western counterparts can only dream of. As a generation who grew up with access to the Internet and mobile devices, the post-90s tend not to respond to traditional advertising and as such are a huge challenge for marketeers. To understand their spending habits and what influences their buying decisions, brands first have to understand their language and how they communicate with one another. Familiarising themselves with Digitalk will enable brands to explore the character and mindset of the typical post-90s consumer. Those who successfully connect with this generation and incorporate their language in marketing strategies will reap the rewards of post-90s spending power for many years to come. Similar to bingo speak – ‘two fat ladies – 88’ or ‘two little ducks – 22’ – Digitalk is a sophisticated method of combining numbers to make phrases based on how they sound when pronounced in Mandarin. For example the numbers ‘5’, ‘2’ and ‘0’ are pronounced as ‘wu er ling’ which sounds very similar to ‘wo ai ni’ meaning ‘I love you’ in Mandarin. Replacing words with numbers gives a lot of colour to this emerging language. It is also fun to learn and communicate with, in the same way that groups of friends adopt their own ‘in-phrases’. As an example, if you sent a text message saying ‘7878’ to one of your friends in China (translated as a friendly instruction to ‘go-away’) you shouldn’t be surprised if they responded with ‘555’ – pronounced ‘wuwuwu’, which is frequently used to mean crying – in this case crocodile tears. At the moment, Digitalk has two main functions. The first is to show affection with messages like ‘I’m thinking of you’ (530), ‘I love you forever and ever’ (5201314) or ‘I want to kiss you’ (53770). The second is more tongue-in-cheek with messages like ‘let’s leave’ (6868), ‘that’s shameless’ (810) or ‘save me’ (9958). The fact that the language has taken on these two primary functions says a lot about Chinese culture and the mentality of the post-90s generation. Culturally, the Chinese tend to adopt a subtle approach when it comes to demonstrating their feelings. Using ‘520’ instead of saying ‘I love you’ can actually get round any potential embarrassment associated with the statement. The same is true when it comes to being cheeky, where words might be too serious for something that is meant to be light-hearted. Like everything else in China, Digitalk is evolving at a lightening pace. For people over 30, the number ‘98’ (pronounced ‘jiu ba’) would usually be interpreted as ‘let’s go’ (zo ba). But for the post-90s, ‘98’ has become shorthand for pub or bar. The pronunciation of the words and numbers hasn’t altered, but young people’s association with them has changed dramatically in the last 10 years. This level of understanding can provide vital insights for marketeers into the lifestyle and mentality of China’s young spenders. The significance of numbers is not a post-modern phenomenon. Numerology has deep-seated roots in Chinese history and culture, with some numbers pertaining to success and fortune while others represent misfortune and bad luck. The number 8 is the luckiest number in Chinese culture because the word 8 sounds similar to the word ‘Fa’ in Mandarin, which implies wealth. The Chinese character for 8 (八) is narrow at the top and gets wider at the bottom, suggesting a greater, more prosperous future. In the modern age of Digitalk, Western companies and brands would do well to tap into the power of 8 to court the post-90s generation. In the UK, Bingo talk is generally more well-known amongst older people, but in China, the opposite is true of Digitalk. Having largely originated on mobile phones and the Internet, it is primarily used by younger people, happy to embrace everything new technology has to offer. Having a thorough understanding of the cultural sensitivities of the Chinese post-90s generation is crucial for brands who want to make Digitalk work for them. As a word of warning, the number ‘2’ should be used with extreme caution as it has cultural implications in China of being stupid or less favourable. This comes from the idea that certain things are ‘seconds’ or second rate. With that in mind, anyone planning to launch a new dating website for affluent young Chinese should think twice before calling it ‘2s Company’ as they probably won’t get many takers!